Adds a sprint button. 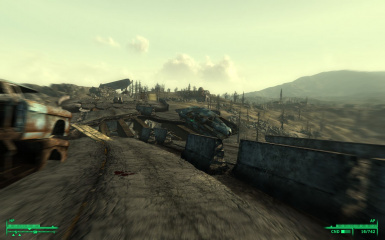 Now you can run freely around the wastes like you've always wanted to, limited only by your action points. LHammonds for the Readme Generator this file was based on. With FOSE: The sprint key replaces the run key. Simply hold down run to sprint. -OR-If you would like to preserve the functionality of the run key, you can set a custom keybinding from the control settings menu of the pedometer. Without FOSE: In NoFOSE mode, you must bind the Sprint Hotkey / Pedometer in your inventory to a hotkey. To start sprinting, press the sprint hotkey and then move forward. To stop sprinting, press the hotkey again. To bind a hotkey, hold down a number key while viewing the inventory and click on the item you want to bind. You can set a sprint delay in the settings menu of the pedometer, which will allow you to run for a certain amount of time without sprinting. So if you choose a delay of 2 you'll need to run forward for 2 seconds before you start sprinting. For both: Sprinting takes action points, and if you run out, you'll have to wait for them to recharge. The more endurance you have, the less AP it takes to sprint, and the more agility you have, the faster you'll go. The amount of weight you're carrying also affects your speed. There are certain situations in which you will be unable to sprint, such as when your legs are broken, or when you're overencumbered. Various screen effects are used to enhance the sense of speed. For a readout of your speed and distance potential and access to various settings, use the Pedometer located in the apparel section of your inventory. Sprint into a hostile enemy (they have to be hostile) to attempt to tackle them. Your strength and unarmed skill will be compared to their strength and endurance, and if you win, they'll be knocked over. If you lose by too much you might be knocked down yourself, so watch out! Attempting a tackle takes 1/4 of your AP, so don't waste it all on the way there. With this perk, you can keep your weapon out while sprinting. Don't expect to be very accurate while you're doing this, though. SprintSpeedMult and SprintAPMult are global variables that can easily be changed in the GECK or ingame using the console. The speed and ap drain formulas are multiplied by these values respectively, so for example if you wanted to halve your speed while sprinting, you would change SprintSpeedMult to 0.5. Setting SprintAPMult to 0 will let you sprint forever. Both variables default to 1. You can force the mod to run in noFOSE mode if you want by setting SprintForceNoFOSE to 1. To set a variable ingame, open the console with the tilde (~) key and enter "set x to y" without quotes, where x is the variable to change and y is the value to change it to. 4. Start Fallout Launcher, click 'Data Files', place a checkmark beside the .esp file(s). 1. Start Fallout Launcher, click Data Files, uncheck the .esp file(s). The tackle perk requires the game's autoaim system to work correctly, so any mods that reduce or remove autoaim will make it harder or even impossible to use tackle. As a general rule, if your crosshairs don't turn red when you aim at enemies, you probably won't be able to tackle them. 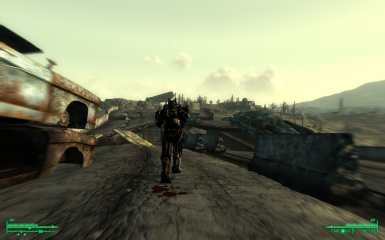 Fallout Wanderer's Edition comes packaged with a version of Sprint Mod balanced for the other changes it makes, so don't use it at the same time as this one. Mods that dynamically change the game's look sensitivity may conflict with Sprint Mod. If you encounter issues with your sensitivity changing to undesired values, try changing the turn radius in the pedometer's settings menu to 1. Sprinting while in god mode usually doesn't work. Due to a quirk in the game engine, the script has to damage your health in order to get the game to recalculate your speed, so god mode isn't supported. If you absolutely must use tgm, you can put your weapon away or pull it back out to make sure your speed is updated. Sprinting while in water has some... exciting results. You're not supposed to be able to sprint in water at all, but I can't enforce that until FOSE adds a function for detecting when you're in water. Until then, enjoy your explosions ;). If it really bugs you, you can fix it by turning off head bobbing in the pedometer settings. As of the current version of FOSE, it's not yet possible to bind buttons on a gamepad. Gamepad players can either run a keyboard emulation program such as xpadder or joytokey, or use noFOSE mode to bind the sprint hotkey to the d-pad. If you do this, make sure to turn off head bobbing, as it causes the controller to vibrate like crazy. You can do whatever you want with this mod but all I ask in return is that you give me credit if you distribute any part of this mod. I would also like to know what mods are including my work.